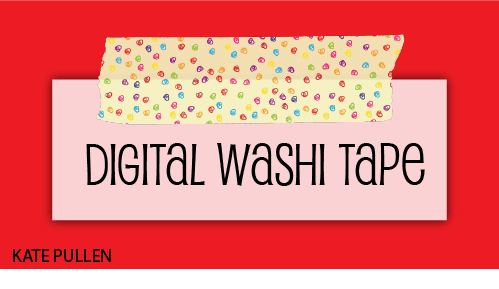 You have heard of digital stamps and digital scrapbooking paper, however, what about digital washi tape? Washi tape is all the rage at the moment! Crafters have fallen in love with this versatile decorative material. Washi tape can be used in so many ways that it is fast becoming a must-have supply for every crafter's work box. There's no need for digital crafters to miss out on this new trend, if you are a keen digital stamper or digital scrapbooker then you will find that there is a growing supply of digital washi tape available that you can add to your digital crafting kit. What Is Digital Washi Tape? Digital washi tape is small pieces of patterned images which, just like the real thing, are slightly transparent. Some may even have a surface texture to mimic the slightly uneven surface of the torn tape. The tape is used alongside other digital products either as a design feature or to give the illusion of holding a photo or other object in place. Digital washi tape is typically available as png files with transparent backgrounds (it is not a lot of use otherwise as the white background would mask the image under the digital washi tape). Like other digital craft projects, 300 dpi is a common resolution for digital washi tape and this means that you can combine with other items such as digital stamps or digital paper without it detracting from the finished results. If you are new to digital crafting you will find more about digital stamps see here - All About Digital Stamps. There are many ways to use digital washi tape in your digital craft projects. It is a quick and easy way to add some color to a page, for example, use some digital washi tape to 'hold' a photo in place or to 'attach' an embellishment to the front of a digital card. Another way to use digital washi tape is to print the washi tape onto paper and adhere this to a handmade card or scrapbook page. Try to tear the end of your printed washi tape or snip a 'v' shape into the end of the washi tape to disguise the fact that it does not have a torn edge. Digital stampers will want to keep a look out for blank digital washi tape which can be added to a digital stamp and then printed and colored. This is a fun way to add some washi tape designs to your digital stamping projects. We have a sheet of free washi tape digital stamp images which you can download and color to match your craft project. This is free to download in a pdf or jpg here - Washi Tape Digital Stamp. You can also create your own digital washi tape. If you have access to an image editor such as GIMP (which is free!) you can easily create your own custom washi tape following this tutorial - How to Make Digital Washi Tape Tutorial. This is a great way to make your own custom colors or to create washi tape to match a project which you are working on. You will find digital washi tape in digital craft supply stores. It is also worth looking on sites such as Etsy for some more unusual designs. Many digital artists provide free samples of their work, so it is worth checking out some of their blogs for ideas and offers. What's the Best Adhesive to Use When Making Handmade Cards? What Is Cling Mounting Foam and How Do You Use It? If You Can Draw, How About Selling Your Art As Digital Stamps?